For the past few weeks, I have been looking at the work that Jo’s Trust do to raise awareness and provide information on cervical cancer. I have hopefully shared some useful information on cervical cancer, what it is and the different types of cervical cancer, and most importantly information on having a Smear Test. The trust was set up in 1999 by James Maxwell in memory of his wife who passed away from cervical cancer aged just 40 years old, to fill the gap that his wife found in the information that was available to people with cervical cancer. The charity does this by offering a free telephone helpline, which is manned by trained volunteers, along with online forums and local support groups. 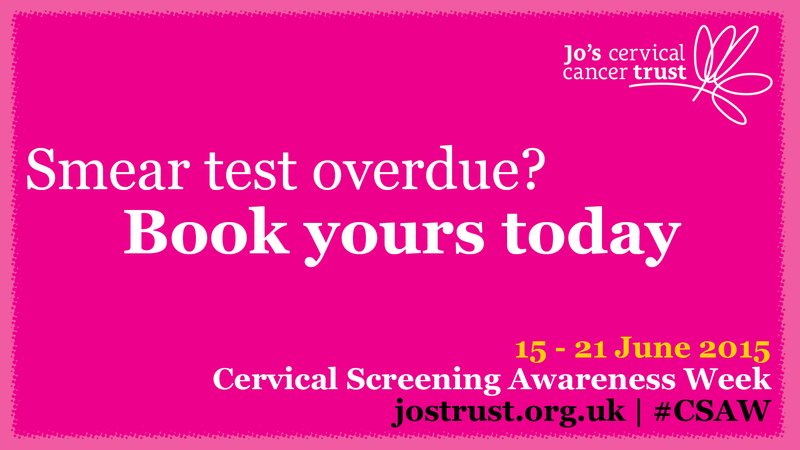 The month of June also played host to Cervical Screening Awareness Week (15th – 21st June) and I took this opportunity to share with you how important it is to go for your smear test and how it’s really not that bad. In fact, I received my reminder letter at the weekend and first thing on Monday morning booked my appointment for a couple of weeks away, no dilly dallying here! I will then plan to go home, have a nice hot bath and a good old pamper as my little treat! With cervical screenings saving around 5,000 lives a year, it really is a case of the earlier you catch it the better and it takes less than 5 minutes to do. Easy! I also addressed the different ways in which you can get involved with the Trust, such as volunteering on their information helpline and taking part in next year’s ‘Ride the Night Event’ in London, which involves a 100km night time bike ride thought the capital city to raise money. So please, please, please, if you receive that little letter in the post with your cervical screening reminder, don’t put it off and for the love of god, don’t not go! Get it booked in and get it done! If you need any more information on any of the topics that I have covered this month, Jo’s Trust website have got it covered!